Well, it's annoyingly difficult to pull off, but if you have 2 Deep One characters in play and don't mind losing one you can make it Night. Remind me why I wouldn't just play a card that naturally makes it Night again? The one corner case where this beats just using a night card that destroys day cards is in a deck where I benefit from sacrificing stuff, eg with twisted acropolis. And I have to have 2 Deep Ones out, unlikely in such a deck. Cost 0 is nice and allows splash, but Deep Ones only exist in green decks anyway. Being able to destroy all day cards without warning, even when you have no domains available, is a nice ability. 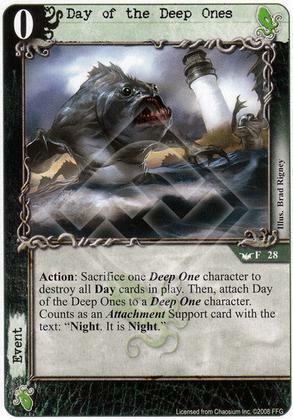 Except that's not what this card does anymore, basilica and hermetic seal are both immune because it's not a night card. Not a card that has aged we'll.